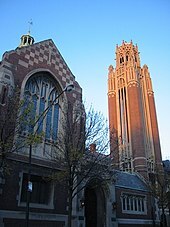 The University of Chicago (UChicago, U of C, or Chicago) is a private research university in Chicago, Illinois. Founded in 1890 by John D. Rockefeller, the school is located on a 217-acre campus in Chicago's Hyde Park neighborhood, near Lake Michigan. 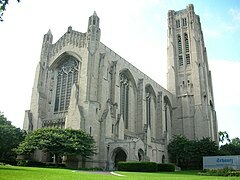 The University of Chicago holds top-ten positions in various national and international rankings. The university is composed of an undergraduate college as well as various graduate programs and interdisciplinary committees organized into five academic research divisions. Beyond the arts and sciences, Chicago is also well known for its professional schools, which include the Pritzker School of Medicine, the Booth School of Business, the Law School, the School of Social Service Administration, the Harris School of Public Policy Studies, the Divinity School and the Graham School of Continuing Liberal and Professional Studies. The university has additional campuses and centers in London, Paris, Beijing, Delhi, and Hong Kong, as well as in downtown Chicago. The University of Chicago has produced many prominent alumni, faculty members and researchers. As of 2018, 98 Nobel laureates have been affiliated with the university as professors, students, faculty, or staff, making it a university with one of the highest concentrations of Nobel laureates in the world. Similarly, 34 faculty members and 18 alumni have been awarded the MacArthur "Genius Grant". In addition, Chicago's alumni and faculty include 54 Rhodes Scholars, 26 Marshall Scholars, 9 Fields Medalists, 4 Turing Award Winners, 24 Pulitzer Prize winners, 20 National Humanities Medalists, 16 billionaire graduates and a plethora of members of the United States Congress and heads of state of countries all over the world. The business school was founded in 1898, and the law school was founded in 1902. Harper died in 1906 and was replaced by a succession of three presidents whose tenures lasted until 1929. During this period, the Oriental Institute was founded to support and interpret archeological work in what was then called the Near East. In 1929, the university's fifth president, 30-year-old legal philosophy scholar Robert Maynard Hutchins, took office. The university underwent many changes during his 24-year tenure. Hutchins reformed the undergraduate college's liberal-arts curriculum known as the Common Core, organized the university's graduate work into four divisions, and eliminated varsity football from the university in an attempt to emphasize academics over athletics. 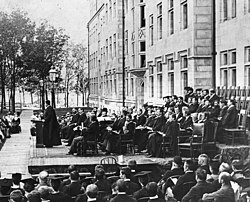 During his term, the University of Chicago Hospitals (now called the University of Chicago Medical Center) finished construction and enrolled their first medical students. Also, the philosophy oriented Committee on Social Thought, an institution distinctive of the university, was created. Money that had been raised during the 1920s and financial backing from the Rockefeller Foundation helped the school to survive through the Great Depression. Nonetheless, in 1933, Hutchins proposed an unsuccessful plan to merge the University of Chicago and Northwestern University into a single university. During World War II, the university's Metallurgical Laboratory made ground-breaking contributions to the Manhattan Project. 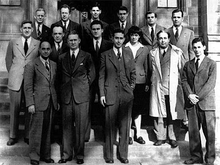 The university was the site of the first isolation of plutonium and of the creation of the first artificial, self-sustained nuclear reaction by Enrico Fermi in 1942. Aerial shots from the University of Chicago campus. The University of Chicago is governed by a board of trustees. The Board of Trustees oversees the long-term development and plans of the university and manages fundraising efforts, and is composed of 55 members including the university President. Directly beneath the President are the Provost, fourteen Vice Presidents (including the Chief Financial Officer, Chief Investment Officer, and Vice President for Campus Life and Student Services), the Directors of Argonne National Laboratory and Fermilab, the Secretary of the university, and the Student Ombudsperson. As of May 2016[update], the Chairman of the Board of Trustees is Joseph Neubauer, and the President of the university is Robert Zimmer. In December 2013 it was announced that the Director of Argonne National Laboratory, Eric Isaacs, would become Provost. Isaacs was replaced as Provost in March 2016 by Daniel Diermeier. The university's endowment was the 12th largest among American educational institutions and state university systems in 2013 and as of 2018[update] was valued at $8.2 billion. Part of President Zimmer's financial plan for the university has been an increase in accumulation of debt to finance large building projects. This has drawn support and criticism from many in the university community. The University of Chicago has an extensive record of producing successful business leaders and billionaires. ARWU has consistently placed the University of Chicago among the top 10 universities in the world, while the 2016/17 QS World University Rankings placed the university in 10th place worldwide. The university's law and business schools rank among the top five professional schools in the United States. The business school is currently ranked first in the US by US News & World Report and first in the world by The Economist, while the law school is ranked fourth by US News & World Report and first by Above the Law. Chicago has also been consistently recognized to be one of the top 15 university brands in the world, retaining the number three spot in the 2019 U.S. News Best Colleges Rankings. In a corporate study carried out by The New York Times, the university's graduates were shown to be among the most valued in the world. In the spring quarter of 2016, the University of Chicago enrolled 5,547 students in the college, 3,249 students in its five graduate divisions, 3,498 students in its professional schools, and 14,095 students overall. In the 2016 spring quarter, international students comprised over 21% of the overall student body, over 27% of students were domestic ethnic minorities, and about 43% of enrolled students were female. Admissions to the University of Chicago is highly selective. The middle 50% band of SAT scores for the undergraduate class of 2019, excluding the writing section, was 1450–1550, the average MCAT score for entering students in the Pritzker School of Medicine in 2011 was 36, and the median LSAT score for entering students in the Law School in 2015 was 171. For the class of 2023, the College of the University of Chicago had an acceptance rate of 5.9%, the lowest in the college's history and among the lowest in the country. The Maroons compete in the NCAA's Division III as members of the University Athletic Association (UAA). 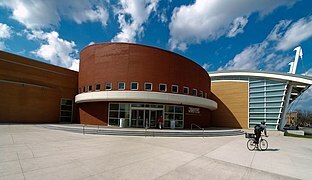 The university was a founding member of the Big Ten Conference and participated in the NCAA Division I men's basketball and football and was a regular participant in the men's basketball tournament. In 1935, the University of Chicago reached the Sweet Sixteen. In 1935, Chicago Maroons football player Jay Berwanger became the first winner of the Heisman Trophy. However, the university chose to withdraw from the Big Ten Conference in 1946 after University President Robert Maynard Hutchins de-emphasized varsity athletics in 1939 and dropped football. (In 1969, Chicago reinstated football as a Division III team, resuming playing its home games at the new Stagg Field.) UChicago is also the home of the ultimate frisbee team Chicago Junk. There are Sixteen Fraternities are Alpha Delta Phi (Chicago Chapter), Alpha Epsilon Pi (Lambda Chapter), Alpha Phi Alpha (Theta Chapter), Delta Epsilon Psi (Alpha Kappa), Delta Kappa Epsilon (Delta Delta), Delta Tau Delta (Gamma Alpha), Delta Upsilon(Chicago Chapter), Kappa Alpha Psi (Iota Chapter), Lambda Phi Epsilon (Psi Chapter), Phi Delta Theta (Beta Chapter), Phi Gamma Delta (Chi Upsilon Chapter), Phi Iota Alpha (Chicago Colony Chapter), Psi Upsilon (Omega Chapter), Sigma Chi (Omicron Omicron Chapter), Sigma Phi Epsilon (Omicron Omicron Chapter) and Zeta Psi (Omega Alpha Chapter). There are Six Sororities are Alpha Kappa Alpha (Beta Chapter), Alpha Omicron Pi (Phi Chi Chapter), Delta Gamma (Eta Zeta Chapter), Delta Sigma Theta (Lambda Chapter), Kappa Alpha Theta (Epsilon Phi Chapter) and Pi Beta Phi (Kappa Chapter) at the University of Chicago, as well as one co-ed community service fraternity are Alpha Phi Omega(Gamma Sigma Chapter). Social fraternities and sororities are not recognized by the university as registered student organizations. Four of the sororities are members of the National Panhellenic Conference There is no Interfraternity Council on campus. As of 2017[update], approximately 20 to 25 percent of students are members of fraternities or sororities. Increasing from the numbers published by the student activities office stating that one in ten undergraduates participate in Greek life in the year 2007. There have been 98 Nobel laureates affiliated with the University of Chicago, 20 of whom were pursuing research or on faculty at the university at the time of the award announcement. Notable alumni and faculty affiliated with the university include 32 Nobel laureates in Economics. No university has had more affiliated Nobel laureates in Economics. In business, notable alumni include Microsoft CEO Satya Nadella, Oracle Corporation founder and the third richest man in America Larry Ellison, Goldman Sachs and MF Global CEO as well as former Governor of New Jersey Jon Corzine, McKinsey & Company founder and author of the first management accounting textbook James O. McKinsey, co-founder of the Blackstone Group Peter G. Peterson, co-founder of AQR Capital Management Cliff Asness, founder of Dimensional Fund Advisors David Booth, founder of The Carlyle Group David Rubenstein, former COO of Goldman Sachs Andrew Alper, billionaire investor and founder of Oaktree Capital Management Howard Marks (investor), Bloomberg L.P. CEO Daniel Doctoroff, Credit Suisse CEO Brady Dougan, Morningstar, Inc. founder and CEO Joe Mansueto, Chicago Cubs owner and chairman Thomas S. Ricketts, and NBA commissioner Adam Silver. In literature, author of the New York Times bestseller Before I Fall Lauren Oliver, Pulitzer Prize-winning novelist Philip Roth; Canadian-born Pulitzer Prize and Nobel Prize for Literature winning writer Saul Bellow; political philosopher, literary critic and author of the New York Times bestseller The Closing of the American Mind Allan Bloom; author of The Big Country and Matt Helm spy novels Donald Hamilton; The Good War author Studs Terkel; writer, essayist, filmmaker, teacher, and political activist Susan Sontag; analytic philosopher and Stanford University Professor of Comparative Literature Richard Rorty; cultural commentator, author, and president of St. Stephen's College (now Bard College) Bernard Iddings Bell; and novelist and satirist Kurt Vonnegut are notable alumni. In science, alumni include astronomers Carl Sagan, a prominent contributor to the scientific research of extraterrestrial life, and Edwin Hubble, known for "Hubble's Law", NASA astronaut John M. Grunsfeld, geneticist James Watson, best known as one of the co-discoverers of the structure of DNA, experimental physicist Luis Alvarez, popular environmentalist David Suzuki, balloonist Jeannette Piccard, biologists Ernest Everett Just and Lynn Margulis, computer scientist Richard Hamming, the creator of the Hamming Code, lithium-ion battery developer John B. Goodenough, mathematician and Fields Medal recipient Paul Joseph Cohen, geochemist Clair Cameron Patterson, who developed the uranium-lead dating method into lead-lead dating, geologist and geophysicist M. King Hubbert, known for the Hubbert curve and Hubbert peak theory, the main components of peak oil, and "Queen of Carbon" Mildred Dresselhaus. Nuclear physicist and researcher Stanton Friedman, who worked on some early projects involving nuclear-powered spacecraft propulsion systems, is also a graduate (M.Sc). Ray Solomonoff, one of the founders of the field of Machine Learning as well as Kolmogorov Complexity, got a BS and MS in Physics in 1951, studying under Rudolf Carnap. In economics, notable Nobel Memorial Prize in Economic Sciences winners Milton Friedman, a major advisor to Republican U.S. President Ronald Reagan and Conservative British Prime Minister Margaret Thatcher, George Stigler, Nobel laureate and proponent of regulatory capture theory, Gary Becker, an important contributor to the family economics branch of economics, Herbert A. Simon, responsible for the modern interpretation of the concept of organizational decision-making, Paul Samuelson, the first American to win the Nobel Memorial Prize in Economic Sciences, and Eugene Fama, known for his work on portfolio theory, asset pricing and stock market behaviour, are all graduates. American economist, social theorist, political philosopher, and author Thomas Sowell is also an alumnus. Brazil's Minister of the Economy Paulo Guedes received his Ph.D. from UChicago in 1978. 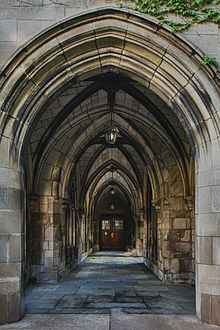 The archway between Bond Chapel and Swift Hall, home of the university's Divinity School. Current faculty include the philosophers Jean-Luc Marion, James F. Conant, and Robert Pippin, anthropologist Marshall Sahlins, historians Dipesh Chakrabarty, David Nirenberg and Kenneth Pomeranz, linguistic anthropology Michael Silverstein, paleontologists Neil Shubin and Paul Sereno, evolutionary biologist Jerry Coyne, Nobel prize winning physicist James Cronin, Nobel Prize winning economists Eugene Fama, James Heckman, Lars Peter Hansen, Roger Myerson, Richard Thaler, and Robert Lucas, Jr., Freakonomics author and noted economist Steven Levitt, erstwhile governor of India's central bank Raghuram Rajan, former Chairman of President Barack Obama's Council of Economic Advisors Austan Goolsbee, Kyoto Prize winner Martha Nussbaum, Shakespeare scholar David Bevington, and political scientists John Mearsheimer and Robert Pape. ^ "About the University". The University of Chicago. 2013. Retrieved December 24, 2013. ^ "About the University". University of Chicago. Retrieved April 3, 2018. ^ As of June 30, 2018. "U.S. and Canadian Institutions Listed by Fiscal Year (FY) 2016 Endowment Market Value and Change in Endowment Market Value from FY 2015 to FY 2016". National Association of College and University Business Officers and Commonfund Institute. 2018. ^ a b "Faculty and Staff, at a glance". University of Chicago Data. University of Chicago. Retrieved March 13, 2019. ^ a b "Students | University of Chicago Data | The University of Chicago". data.uchicago.edu. Retrieved October 14, 2017. ^ "About the University". The University of Chicago. Retrieved October 14, 2017. ^ "University of Chicago opens groundbreaking sustainable field station". The University of Chicago. Retrieved July 8, 2015. ^ AvenueChicago, The University of ChicagoEdward H. Levi Hall5801 South Ellis; Us, Illinois 60637773 702 1234 Contact. "About the University". The University of Chicago. Retrieved 2019-03-14. ^ "ARWU World University Rankings 2017 - Academic Ranking of World Universities 2017 - Top 500 universities - Shanghai Ranking - 2017". www.shanghairanking.com. ^ "Best Colleges, US News & World Report Rankings: University of Chicago" (2017). U.S. News & World Report (USNews.com). Retrieved April 10, 2019. ^ "World Ranking of more than 500 Universities". metauniversityranking.com. Retrieved February 15, 2018. ^ "World University Rankings". Times Higher Education (THE). August 18, 2017. Retrieved February 15, 2018. ^ "QS World University Rankings 2018". Top Universities. June 5, 2017. Retrieved February 15, 2018. ^ "UChicago Global | The University of Chicago". global.uchicago.edu. Retrieved 2019-03-31. ^ "Downtown Campus - Gleacher Center". The University of Chicago Booth School of Business. Retrieved 2019-03-31. ^ "Chicago school (sociology)" Check |url= value (help). November 28, 2017. ^ "History of Law and Economics" (PDF). University of Montreal. Retrieved August 26, 2009. ^ "The Chicago School". Britanica Academic Edition. Retrieved October 12, 2011. ^ Hanson, John Mark. "Building the Chicago School" (PDF). ^ Angelo, Joseph A. (November 30, 2004). Nuclear Technology. Greenwood Press. p. 1. doi:10.1336/1573563366. ISBN 1-57356-336-6. ^ "Duffy is named Director of the University Press". The University of Chicago Chronicle. April 27, 2000. Retrieved April 30, 2006. ^ "The Obama Presidential Center". BarackObamaFoundation.org. ^ "MacArthur Fellows". The University of Chicago. Retrieved July 8, 2016. ^ a b "Rhodes Scholarships – Number of Winners by Institution – U.S. Rhodes Scholars 1904–2016" (PDF). The Rhodes Trust. Retrieved May 23, 2016. ^ "Statistics". Marshallscholarship.org. Retrieved January 26, 2017. ^ "Fields Medalists". University of Chicago. ^ a b Janhavi Kumar Sapra (August 11, 2010). "Billionaire Universities". Forbes. Retrieved August 31, 2010. ^ Goodspeed, Thomas Wakefield (1916). A History of the University of Chicago. Chicago: The University of Chicago Press. p. 137. ISBN 0-226-30367-5. ^ "The Decennial Publications of the University of Chicago". 1. Chicago: The University of Chicago Press. 1903: 498. ^ "History". University of Chicago. Retrieved May 26, 2011. ^ "The University of Chicago and its Donors, 1889–1930". University of Chicago. Retrieved November 28, 2015. ^ a b Rudolph, Frederick (1962). The American College and University: A History. Knopf. p. 351. ISBN 978-0-8203-1284-2. ^ "Agreement Between Stephen A. Douglas and John C. Burroughs (1856), Folder 2, Box 3, Old University of Chicago Records, Special Collections, University of Chicago" (PDF). UChicago.edu. Retrieved June 26, 2017. ^ John Boyer, The University of Chicago: A History (Chicago: University of Chicago Press, 2015), 58–59. ^ Old University of Chicago Records, Folder 4, Box 9, Special Collections, University of Chicago. ^ John Boyer, The University of Chicago: A History (Chicago: University of Chicago Press, 2015), 59. ^ Firestein, Martin. "Harper College Archives – Wiliiam Rainey Harper". Harper College Library Archives. Retrieved September 21, 2017. ^ "History and Mission, The University of Chicago Divinity School". ^ Goodspeed, Thomas Wakefield (1972). A History of the University of Chicago, Founded by John D. Rockefeller: The First Quarter-Century. University of Chicago Press. pp. 20–22. ISBN 9780226303833. ^ Ladd, Tony (1999). Muscular Christianity. Grand Rapids, MI: Bridgepoint Books. p. 65. ISBN 0-8010-5847-3. ^ "Chicago Booth History". University of Chicago Booth School of Business. Retrieved September 8, 2009. ^ "History of the Law School". University of Chicago Law School. Retrieved September 8, 2009. ^ "History of the Office:William Rainey Harper". University of Chicago. Retrieved September 8, 2009. ^ "History of the Office". University of Chicago. Retrieved September 8, 2009. ^ "A Brief History of the Oriental Institute". The Oriental Institute. Since its establishment in 1919, The Oriental Institute has sponsored archaeological and survey expeditions in every country of the Near East. ^ "The Common Core". University of Chicago Office of College Admissions. Archived from the original on April 26, 2009. Retrieved July 31, 2009. ^ a b c "History of the Office". The University of Chicago Office of the President. November 6, 2008. Retrieved September 14, 2009. ^ "A Brief History of the Medical Center". The University of Chicago Medical Center. Retrieved September 14, 2009. ^ "The University of Chicago proposal". Northwestern university. Retrieved September 8, 2009. ^ a b "University of Chicago Met Lab". Atomic Heritage Foundation. Retrieved July 31, 2009. ^ "The First Reactor". December 1982. Retrieved July 15, 2009. 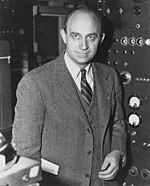 On December 2, 1942, in a racquets court underneath the West Stands of Stagg Field at the University of Chicago, a team of scientists led by Enrico Fermi created man's first controlled, self-sustaining nuclear chain reaction. ^ Genius Or Fraud? Bettelheim's Biographers Can't Seem To Decide, Chicago Tribune, Ron Grossman, January 23, 1997. ^ An Icon of Psychology Falls From His Pedestal, New York Times, Books, Christopher Lehmann-Haupt (review of The Creation of Dr. B by Richard Pollak), January 13, 1997. ^ THE BATTLE OVER BETTELHEIM, Weekly Standard, Peter D. Kramer, April 7, 1997. ^ Fang, Marina. "Born amidst '60s student protests, Kalven Report remains controversial". ChicagoMaroon.com. Retrieved January 26, 2017. ^ "The University of Chicago – Alumni Weekend". Alumniweekend.uchicago.edu. Archived from the original on September 7, 2008. Retrieved September 14, 2009. ^ Boris, Eileen (1999). Voices of Women Historians: The Personal, the Political, the Professional. Indiana university Press. ISBN 978-0-253-33494-7. Retrieved June 11, 2008. ^ "Hanna Holborn Gray (1978–1993)" (Press release). University of Chicago News Office. March 9, 2006. Retrieved September 14, 2009. ^ Beam, Alex (2008). A Great Idea at the Time. Public Affairs. p. 152. ISBN 978-1-58648-487-3. ^ Staley and Lippert, Oliver and John (October 15, 2008). "Milton Friedman Institute Spurs Chicago Faculty Clash (Update3)". Bloomberg. ^ Jacobsen, Kurt (August 26, 2008). "Milton Friedman gives Chicago a headache". The Guardian. London. ^ Cohen, Patricia (July 12, 2008). 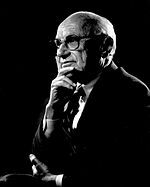 "On Chicago Campus, Milton Friedman's Legacy of Controversy Continues". The New York Times. ^ "Milton Friedman Petition". Archived from the original on January 8, 2009. ^ Cochrane, John. "Comments on the Milton Friedman Institute Protest letter". ^ "Booth Donates $300 Million to Chicago Business School". Bloomberg. November 7, 2008. Retrieved November 10, 2008. ^ Pridmore, Jay. "Make No Little Quads". University of Chicago Magazine. ^ "$25 million gift from Jules and Gwen Knapp will help build 10-story medical research facility at the University of Chicago" (Press release). University of Chicago News Office. Retrieved June 11, 2006. ^ Smith, Mitch (May 8, 2014). "University of Chicago announces $4.5 billion fundraising campaign". Chicago Tribune. Retrieved December 22, 2015. ^ Glanton, Dahleen (September 30, 2015). "U. of C. gets $100 million donation to study global conflict". Chicago Tribune. Retrieved December 2, 2015. ^ "U.S. Department of Education Releases List of Higher Education Institutions with Open Title IX Sexual Violence Investigations". U.S. Department of Education. Retrieved July 14, 2014. ^ ""America's most beautiful college campuses", ''Travel+Leisure'' (September 2011)". Travelandleisure.com. July 10, 2014. Retrieved July 29, 2014. ^ "Architecture". University of Chicago. Retrieved November 28, 2015. ^ a b c d e f g Schulze, Franz; Harrington, Kevin (2003). Chicago's Famous Buildings (5th ed.). University of Chicago Press. pp. 246–50. ISBN 0-226-74066-8. ^ "Architectural Details". The University of Chicago Magazine. December 2002. Retrieved April 30, 2006. ^ Robertson, David Allan (1919). The University of Chicago: An Official Guide (3rd ed.). University of Chicago Press. p. 48. Retrieved August 31, 2009. ^ Puma, Amy Braverman (2007). "There Will Be Books". University of Chicago Magazine. Retrieved September 6, 2009. ^ a b Braverman, Amy M. (February 2005). "2020 Vision". University of Chicago Magazine. 27 (3). Retrieved September 16, 2009. ^ "Of Milestones and Momentum". The University of Chicago Magazine. 100 (6). July–August 2008. Retrieved September 16, 2009. ^ The University of Chicago Magazine. Magazine.uchicago.edu. Retrieved on August 15, 2013. ^ "Site of the First Self-Sustaining Nuclear Reaction". National Historic Landmarks Program. Retrieved September 12, 2009. ^ "About Us". Frank Lloyd Wright Preservation Trust. Archived from the original on December 19, 2007. Retrieved September 8, 2009. ^ "Room 405, George Herbert Jones Laboratory". National Historic Landmarks Program. Retrieved September 12, 2009. ^ "Henry Hinds Laboratory Architect's Drawings". University of Chicago Archival Photographic Files. Retrieved September 10, 2009. ^ "Overview". The University of Chicago. Archived from the original on June 16, 2008. Retrieved October 10, 2009. ^ "The University of Chicago Center in Paris". University of Chicago. ^ "Board of Trustees". The University of Chicago. Retrieved May 17, 2016. ^ "University Organization Chart". The University of Chicago. Retrieved August 16, 2009. ^ "Major U of C donor to head school's board of trustees". Crain's Chicago Business. Retrieved May 17, 2016. ^ "Daniel Diermeier appointed provost of University of Chicago | UChicago News". ^ "U.S. and Canadian Institutions Listed by Fiscal Year 2012 Endowment Market Value and Percentage Change* in Endowment Market Value from FY 2011 to FY 2012 (Revised February 4, 2013)" (PDF). 2013. Archived from the original (PDF) on May 12, 2013. Retrieved January 19, 2014. ^ "University of Chicago endowment grows to $8.2 billion". Crain's Chicago Business. Retrieved November 15, 2018. ^ McDonald, Michael (March 17, 2014). "University of Chicago Is Outlier With Growing Debt Load". Bloomberg. 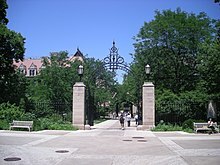 ^ a b "The University of Chicago". College Navigator. Retrieved August 6, 2009. ^ a b "The University of Chicago Academic Calendar". Retrieved August 17, 2009. ^ "Academic Regulations and Procedures" (PDF). The University of Chicago. Archived from the original (PDF) on October 14, 2009. Retrieved August 13, 2009. Students register for three or four courses per quarter. Over the typical four-year program (twelve quarters), a student normally registers for at least six four-course quarters and as many as six three-course quarters. ^ "Majors". University of Chicago College. Archived from the original on April 23, 2014. Retrieved May 17, 2016. ^ "Minors". University of Chicago College. Archived from the original on February 11, 2014. Retrieved May 17, 2016. ^ "Departments and Academic Degree Programs in the College". University of Chicago. Archived from the original on October 13, 2008. Retrieved July 26, 2009. ^ "New Collegiate Division". University of Chicago. Archived from the original on December 8, 2009. Retrieved July 26, 2009. ^ "Another Chapter in the Life of the College". The University of Chicago Magazine. Retrieved September 3, 2006. ^ "The Core". University of Chicago Office of College Admissions. Archived from the original on December 25, 2013. Retrieved December 24, 2013. ^ Top University In USA | Best Universities In USA | University In The USA Archived May 14, 2013, at the Wayback Machine. Uniintheusa.com. Retrieved on August 15, 2013. ^ "University of Chicago makes its first foray into engineering". International Business Times. March 8, 2011. Retrieved May 17, 2016. ^ "Autumn Quarter 2015 Statistical Reports" (PDF). University of Chicago Registrar. Archived from the original (PDF) on September 5, 2018. ^ "About | University of Chicago Graham School". Retrieved May 17, 2016. ^ "About the Lab Schools". The University of Chicago Laboratory Schools. 2005. Archived from the original on September 4, 2006. Retrieved September 3, 2006. ^ "About the University of Chicago Charter School". University of Chicago Urban Education Institute. Archived from the original on July 25, 2009. Retrieved August 13, 2009. ^ "Chicago School for Children with Learning Disabilities". Hyde Park Day School. Retrieved September 9, 2009. The Hyde Park Day School (HPDS) is a private, not-for-profit day school serving the needs of children with learning disabilities... With two Illinois locations on the University of Chicago campus in Chicago and north suburban Northfield, HPDS is the only school of its kind in the Chicago area. ^ "Caring for the Whole Person". Sonia Shankman Orthogenic School. Retrieved May 19, 2018. ^ "The University of Chicago School Mathematics Project (UCSMP)". The University of Chicago. Archived from the original on May 16, 2006. Retrieved May 28, 2006. ^ "about CAS". The Council on Advanced Studies. November 17, 2007. Retrieved November 17, 2007. ^ "Academic publishing veteran to direct the University Press". The University of Chicago Chronicle. July 12, 2007. Retrieved July 12, 2007. ^ "The University of Chicago Library". www.lib.uchicago.edu. Retrieved May 17, 2016. ^ "About the John Crerar Library". www.lib.uchicago.edu. June 13, 2013. Retrieved May 17, 2016. ^ "Eckhart Library". University of Chicago Library. Retrieved October 26, 2013. 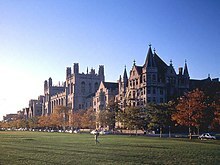 ^ "College Closeup: University of Chicago". Peterson's. Archived from the original on March 10, 2007. Retrieved August 19, 2006. 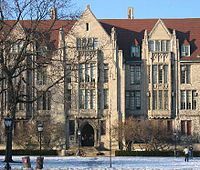 ^ "NSF – NCSES Academic Institution Profiles – University of Chicago, The : Total R&D expenditures, by source of funds and R&D field: 2015". ncsesdata.nsf.gov. Archived from the original on December 21, 2016. Retrieved March 2, 2017. ^ "University of Chicago Carnegie Classifications". Carnegie Foundation for the Advancement of Teaching. Retrieved May 17, 2016. ^ "Name Change – FAQ". Big Ten Academic Alliance. Retrieved June 30, 2016. ^ "Big Ten's Academic Division Changes Name". Inside Higher Ed. June 30, 2016. Retrieved June 30, 2016. ^ "Institutes and Centers". The University of Chicago. Retrieved May 17, 2016. ^ "About TTI-C". August 2009. Retrieved August 17, 2009. An agreement between the University of Chicago and TTI – C allows cross-listing of computer science course offerings between the two institutions, providing students from each institution the opportunity to register in the other's courses. ^ Marine Biological Laboratory to affiliate with University of Chicago – Health & wellness. The Boston Globe (June 12, 2013). Retrieved on August 15, 2013. ^ "History of the Department". Retrieved August 17, 2009. ^ "Abstract of Robert A. Millikan Oil Drop Experiment Notebooks". Caltech Institute Archives. Retrieved September 8, 2009. ^ Cox, John D. (2005). Climate crash: abrupt climate change and what it means for our future. National Academies Press. p. 27. ISBN 978-0-309-09312-5. Retrieved September 9, 2009. In 1947, at the University of Chicago, chemist Willard F. Libby discovered a powerful new technology known as radiocarbon dating. Libby would win the Nobel Prize in Chemistry in 1960 for developing this geological clock. ^ "Background and History of UChicago Arts". Arts.uchicago.edu. August 5, 2012. Retrieved July 29, 2014. ^ a b "These 7 Schools Have the Richest Alumni — Is Yours On the List?". mic.com. Retrieved June 28, 2015. ^ a b "World's top 100 universities for producing millionaires". Times Higher Education. Retrieved June 28, 2015. ^ a b "3 Public Universities Made List of 15 Schools With the Wealthiest Alumni". ABC News. Retrieved June 28, 2015. ^ "QS World University Rankings 2016/17". Top Universities. QS Quacquarelli Symonds. Retrieved September 15, 2016. ^ "Performance in Academic Ranking of World Universities by Subject Fields". Academic Ranking of World Universities. Retrieved December 29, 2015. ^ "Bloomberg Businessweek: The Complete 2012 Business Schools Ranking, 2012-11-15". BusinessWeek.com. November 15, 2012. Retrieved June 26, 2017. ^ "2018 MBA & Business School Rankings | Which MBA? | The Economist". The Economist. Retrieved 2018-11-15. ^ Shepherd, David Lat, Elie Mystal, Staci Zaretsky, Kashmir Hill, Marin, Mark Herrmann, Jay. "The 2018 ATL Top 50 Law School Rankings". Above the Law. Retrieved 2018-11-15. ^ "World Reputation Rankings 2015". Times Higher Education. Archived from the original on May 6, 2016. ^ "Princeton tops list of 2017 U.S. News Best Colleges Rankings". September 13, 2016. Retrieved September 13, 2016. ^ "Global Companies Rank Universities". NYTimes.com. October 25, 2012. Retrieved August 3, 2016. ^ a b c "Spring Quarter 2016 4th Week Quarterly Census Enrollment Reports" (PDF). University of Chicago Registrar. Archived from the original (PDF) on September 5, 2018. ^ "Spring Quarter 2012 Statistical Report" (PDF). Archived from the original (PDF) on August 20, 2012. Retrieved August 12, 2012. ^ Office of the Registrar (June 21, 2012). "SPRING QUARTER 2012 STATISTICAL REPORT" (PDF). registrar.uchicago.edu]. 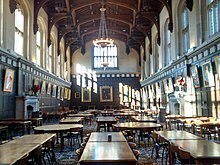 Chicago, IL, USA: University of Chicago. Table 7. Archived from the original (PDF) on August 20, 2012. Retrieved August 14, 2012. ^ "Profile for the Class of 2019 | College Admissions | The University of Chicago". collegeadmissions.uchicago.edu. Archived from the original on April 22, 2016. Retrieved May 17, 2016. ^ "Admissions FAQs". Pritzker School of Medicine. Archived from the original on June 14, 2012. Retrieved August 12, 2012. ^ "FAQs: About the Law School". The University of Chicago Law School. Retrieved May 17, 2016. ^ Smith, Justin (April 1, 2019). "Acceptance Rate Drops to Record Low 5.9 Percent for Class of 2023". Chicago Maroon. ^ Selingo, Jeffrey J. (June 16, 2018). "Perspective | Now that the University of Chicago dropped its testing requirement for applicants, will other elite colleges follow?". Washington Post. ISSN 0190-8286. Retrieved June 18, 2018. ^ a b c "Quick Facts: 2012–13 Summary". 2013. Retrieved April 23, 2014. ^ McNeill, William Hardy (1991). Hutchins' university: A Memoir of the University of Chicago, 1929–1950. Chicago: University of Chicago Press. ISBN 0-226-56170-4. ^ "Student Activities". University of Chicago Office of College Admissions. 2008. Archived from the original on May 10, 2009. Retrieved June 27, 2009. ^ a b "UChicago Student Activities Database". Archived from the original on June 9, 2010. Retrieved June 27, 2009. ^ "10 unusual names for a newspaper". BBC News. February 3, 2011. Retrieved March 15, 2017. ^ "UChicago SG". University of Chicago Student Government. 2014. Retrieved July 20, 2014. ^ a b "Greek Life On Campus". University of Chicago Office of Registered Clubs and Student Activities. 2007. Archived from the original on February 11, 2007. Retrieved March 8, 2007. ^ "Fraternies and Sororities". University of Chicago Admissions. 2007. Archived from the original on September 4, 2006. Retrieved March 12, 2007. ^ a b Golus, Carrie (October 2002). "Geeks Go Greek". University of Chicago Magazine. 95 (1). ^ "Houses and Halls". The University of Chicago. Archived from the original on September 22, 2016. Retrieved September 14, 2016. ^ a b "Housing and Dining". University of Chicago Office of College Admissions. Archived from the original on May 8, 2009. Retrieved September 10, 2009. ^ "About Graduate Housing". Archived from the original on July 21, 2012. Retrieved July 24, 2009. ^ "World's largest Scavenger Hunt begins in Chicago" (Press release). University of Chicago News Office. Retrieved June 13, 2005. ^ "Nobel Laureates". The University of Chicago. December 10, 2008. Archived from the original on May 20, 2009. Retrieved October 4, 2011. ^ "Nobel Laureates and Universities". Nobel Foundation. 2008. ^ a b "Nobel Laureates". The University of Chicago. Retrieved September 29, 2016. ^ Wile, Rob (October 15, 2013). "3 Nobel Committee Members Tell Us Why So Many Economics Laureates Come From Chicago". Business Insider. Retrieved November 13, 2017. ^ Harms, William (June 8, 2006). "Graduate students win Fulbright-Hays fellowships". 8. University of Chicago Chronicle. Retrieved July 30, 2009. ^ Yoe, Mary Ruth (February 2004). "Everybody's a critic". University of Chicago Magazine. 96 (3). ^ Guibert, Susan (April 18, 2014). "Chicago Booth's Gentzkow awarded 2014 Clark Medal". UChicago News. Retrieved November 13, 2017.